From my Newsletter: In the Studio with Nancy, Volume 4 (sign up here) with additional information. See my video on Cutting Metal Discs and How to Make Washers. 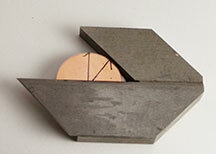 Also, my webpages: Cutting Metal Discs and Making Washers. Why would you need to find the center of a disc? Well, if you are making domed beads, let’s say, you want them to hang correctly (or you don’t, but for this discussion we are going with beads with a center hole). If the hole is off-center, the beads will not hang evenly. So, I’m going to show you two shortcuts to finding center. My solderless beads with center holes. The first shortcut involves making a little template. You can make a template for each size disc that you will use. I don’t recommend using circle templates, which have four or more, equidistant marks. In theory, you draw a line, from one mark to the other, creating a + on the disc. I say “in theory” because there are variables that occur that will result in an off-center hole. The width of your line, is one of the biggest problems. Also, drawing the line, even 1/10th of a millimeter off, can move the center mark off true. Plastic file folders (Big Lots or the Dollar Store, Dollar Tree, etc.) or a Quilter’s Gridded Plastic Template. You want a stiff plastic, not floppy like vinyl. You’ll need a clear (the gridded template works) and a color. Ultra fine Sharpie (I like the retractable style). Optional – a scalpel or razor knife. 1 mm twist drill (aka, drill bit). I recommend using High Speed Steel drills. The link is for a drill with a 3/32″ shank – especially useful for those with quick change handpieces. The following directions are for a 1″ diameter circle. Adjust the directions for each size that you want to make. Set your dividers to half the size of your disc. So, in our example, the dividers will be set to 1/2″. Ensure that you have enough room to create a 1″ circle plus a border of 1/2″ or so. (See example). Cut out the square. from both sheets of plastic. Make them the same size. At this point, you might want to put a piece of wood or cardboard under your work area. 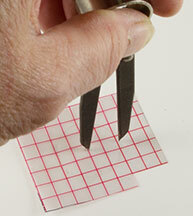 Press one end of the dividers in the approximate center of your CLEAR cutout square. Scratch a circle in the plastic. With a 1mm drill bit, drill a hole into the center of the clear circle. It should be easy to see the center mark as this is where you put the first leg of the divider. Take the colored square of plastic and insert the point into the approximate center– just like you did with the clear material. Adjust the dividers to be A HAIR – A VERY THIN HAIR, larger than the 1/2″ it was originally set at. 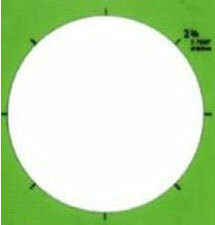 This time, instead of just marking the circle, you will be cutting out a circle. So, press a bit harder and keep going around until the circle is cut out. You can use the scalpel or the razor knife to cut stubborn parts. Just be sure that you don’t change the shape of the circle with the knife/scalpel. It helps to hold the dividers in one hand and move the plastic with the other. You should now have two squares, the clear one with a scribed circle and the colored one, with a cutout circle. Circle on clear plastic is highlighted with a sharpie for photographic clarity. You can also use the marker, if you are having a hard time seeing the scribed line, while trying to match up the circles. (Please ignore the cutout corner. I was using scrap). Line up the circles and clamp and/or tape the tops of the squares together. I used clamps first so, that I could adjust the fit. Double check for alignment and fit. If the disc can move around inside the cutout, you need to remake the cutout. The disc needs to fit nice and tight inside it. Place a piece of masking tape across the back of the disc/cutout to hold it in. You can also just hold it. Flip over the package so that the clear side is facing up. 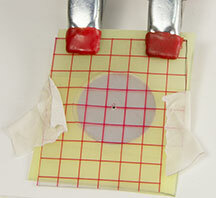 Place the center punch into the hole that you drilled into the clear plastic and push down into the metal. You should have a visible dent. Alternately, you can mark the center with a sharpie. If you are making multiples, try super glueing two or three discs together (perfect alignment of the discs is VERY IMPORTANT!) and following this technique. If you use super glue, either pry apart with a knife and then use a super glue remover (Bondini Bgr-6 Brush-on) or torch the discs until they separate and the glue is burned up. GOOD VENTILATION IS REQUIRED. You could also try rubber cement. The (almost) finished template. Here, I show it clamped before taping. The easiest method of all for finding center on a disc! Buy this: You can make your own (at Instructables) or purchase at: Penn Tool. You just push the disc in, as far as it will go (in the back, I guess – hard to tell back from front). On the other side (the one with the long straight edge) run a marker line down the front of your disc. Give the disc about a 1/2 turn and draw another line. You can draw several lines if you want. Where the lines intersect, use the center punch and make your dent. Easy peasy chocolate cheesy. Note two intersecting lines. Although, I didn’t turn it a full 1/2 turn (obviously). That’s it. Why, oh why did I ever mess around with circle templates? I can’t tell you how many off-centered beads I made (back in the day). 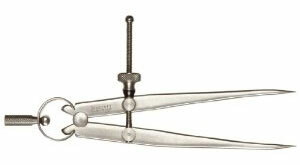 One of my newsletter subscribers purchased the centering tool discussed in the last newsletter. She was having a difficult time finding center on a 26g disc because the disc was so thin and it was slipping behind the tool. This resulted in an off-center, center mark. 1. 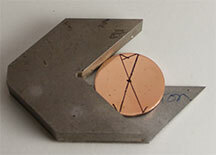 Choose a piece 22g or 20g brass or copper that has at least, one perfect 90 degree angle. 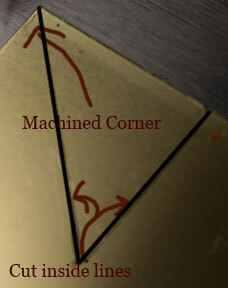 the easiest way to do this is to use a machined corner – one that is present when you first get your sheet metal. 2. Press the machined corner into the tool, fitting it perfectly and tightly. Clamp, if necessary, to hold it still for step 3. 3. 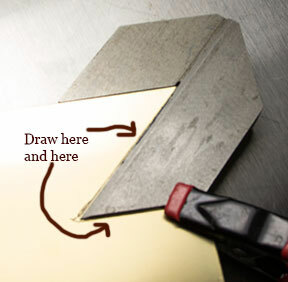 Mark out the shape of the bottom triangle, using the bottom half of the tool as your template. I recommend using an Ultra Fine Point Sharpie. If you use a thick marker, the size will be even more off. You want to make this triangle fit, almost perfectly, in the space. 4. Now, you need to cut out the triangle. Cut inside of the lines you made, otherwise, the piece won’t fit – it will be too large. You might still end up with a bit of overage but don’t worry – as long as it’s just a little too big. Don’t touch the machined side. I used French shop shears to cut the 22g and then cleaned up the cut edges with my belt sander. You can also use files or 220 sandpaper. Having the cut edges perfectly square is not uber important. But, the machined edge needs to stay perfectly square. Don’t do anything to the machined edge – no filing, no sanding. If you use the shop shear, you’ll have to flatten the metal as it curls a bit. It helps, to prevent deformation of the metal, to place the metal under a block of wood and then hammer it. You can use any “heavyish” metal/plastic/leather/wood hammer if you use the block method. If you don’t have wood, just use a wood, plastic or leather mallet. Don’t hammer on the machined edge – you could deform it enough to throw off the symmetry of the edge. 5. 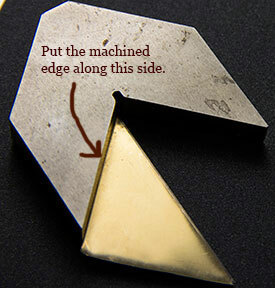 Put the brass triangle into the tool, make sure that it fits and that there is no overhang on the “drawing edge” of the tool. No brass peeking over the edge. The perfect, machined edge should be on the thick, inside edge of the tool. 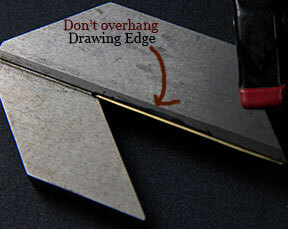 (Image below of “what not to do” and the next image shows where to place the machined edge). An image of “what not to do“. 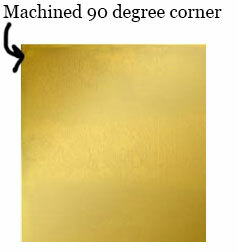 Where to place the machined edge. 6. If it fits, sand the brass on one of the flat sides and on the inside edge of the tool – where the brass will be glued flat. Wipe away dust and superglue the brass triangle in place. I’ve found that adding the triangle creates enough thickness so that the disc doesn’t slip behind. You can also decide to just clamp the triangle in place – if you don’t want it there permanently. 7. 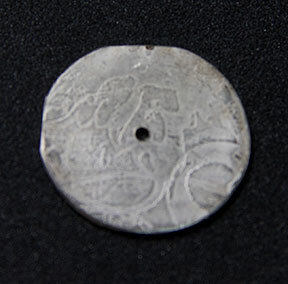 See my (a reject disc with several non-round edges) sample using 26 gauge sterling. The centered, if non-round disc. The last method I will discuss is using the dividers to scribe your circle. The benefit of this method is that your center is marked by the dividers. The method is the same as for making the template (above) but, instead of scribing on plastic, you place one leg, of the dividers, where you want the center of your circle to be and the other leg at 1/2 the diameter of your circle. Drag the dividers around the center mark and make the circle. Now, all that you have to do, is saw out the shape. I’ve tried scribing and then using a disc cutter BUT, it is almost impossible to line it up exactly. After sawing out your circle, roll the disc along a file and then, sandpaper, to true up the shape. If you don’t own a disc cutter and don’t want to buy discs, this is the method to use.